3 PEAKS CYCLOCROSS RACE 2013 | Riders Cycle Centre. Cycle repair and service workshop. 50+ 5Star Google reviews. Bicycle consultancy. Custom wheel & bike builder. Maintenance courses. With only a few weeks to go before the 3 Peaks Cyclo Cross race I began my assault upon its reputation. Youtube, Google and Flickr where worked overtime to feed me the information needed to conquer the legend, to summit Yorkshire triplets, to go where no man ha…………………. Bloody hell, I’ve only a week till the 3 Peaks and I have no Cyclo Cross bike. Where is the phone. “Hello. Mr Pickard of Jedicyclesport. It’s Stuart from RCC. Can you help me”. Now don’t deny it. We all like to look at everyone else bikes. Before we even make eye contact with the rider we sneak a little look at the manufacturers sticker, the adorning group set and rotating wheels of lightness. Well, i’m no different. But being a little short of 3 Peaks geek knowledge I put together what was to be a winning combination. Not a podium winning combination but a bike that did me proud. Race day brought forth the usual pre race nerves. Sick as a pig, delly belly and constant trips to the lav. The start line did nothing to calm the mind but at the sound of the horn I entered the zone 🙂 Somewhere it read “There will be a rolling start out of Helwith behind a pace car”. Sounds good. A nice gentle start to get you warmed up. Wrong, all out. Full bore. My lack of concentration on the start line meant I was shuffled to the back whilst seasoned veterans merged their way to the front. This called for some serious sprinting and an all out effort to gain some valuable places. The squeal of badly adjusted cyclocross brakes signalled a change of pace. We left the tarmac and headed off road. This was where the 3 Peaks started. 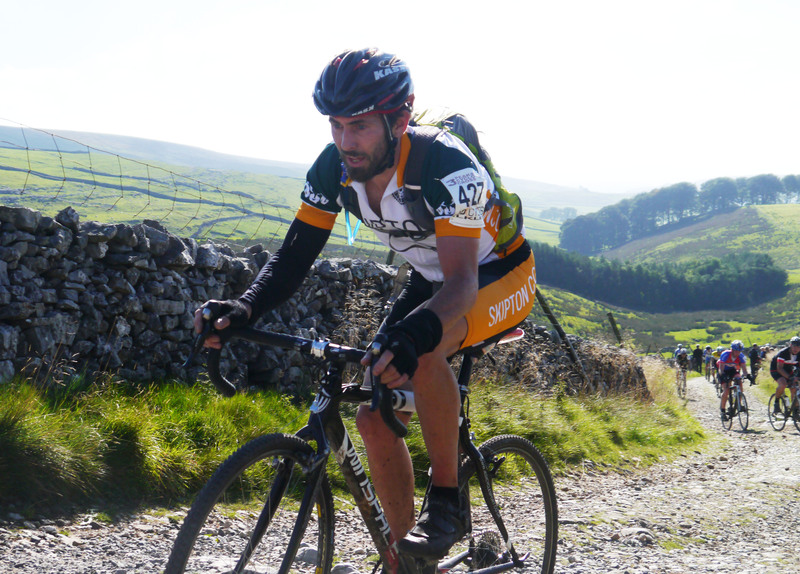 The ascent and descent aboard a completely inadequate bike of Yorkshire’s Ingleborough, Whernside and Pen-y-ghent. Now lets just skip forward a little bit. I could continue to blog. I could bore the pants off you with radical quotes and how gnarly it all was. I could continue to only include the parts that make me sound great but I would rather wrap this up because……………. For all the footage I watched and for all the countless bits of info I digested running up to the race, once I had crossed the finish line and collapsed upon cool green grass could I truly comprehend the event, the task I had undertaken and soak up the feeling that flowed from me. I nervously clasped my finishing chit in my hand. The peaks had beaten me. I had struggled round giving it my all. I had nothing left but my pride felt I had let myself down. I had wanted to finish within a time limit but plan A went out the window half way up Whernside. Mr Calf, one and two had other plans. Plan B was implemented. My watch was put into my rucksack and auto pilot was engaged. Jade was walking towards me. I needed to see my time before she go to me. I needed to prepare myself. I glanced down. I smiled. I looked at Jade and emotion took over. I was happy. Very happy. A very wobbly, knackered happy and I think Jade knew that. No amount of online advice, footage or forums could have prepared me for those 4.08 hrs. An event and race that speaks in actions and not words. A truly epic event and one which I intend to visit again.